As industrial equipment manufacturer Yaskawa Electric forces the MOTOMAN robot out of its comfort zone on the factory floor, we see it quickly acquiring new skills. First the robot developed the ability to sort mail. Now it has learned to play taiko drums. 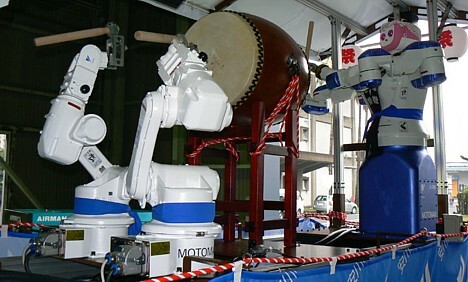 On July 21, a team of four MOTOMAN machines -- two dual-armed MOTOMAN-DIA10 robots and two MOTOMAN-HP3 welding robots -- gave a special taiko performance at the nearly 400-year-old Kokura Gion Daiko Festival in Kitakyushu, which is famous for its traditional drumming competition. Organizers invited the robots to spice up the special opening ceremony for the competition's 60th anniversary. The robots -- the first ever to play taiko drums at the ancient festival -- were paraded through the crowd of spectators on a float while they performed. Yaskawa worked with festival organizers for four months to teach the robots the proper rhythm, technique and choreography for the performance, which was seen as a success. Here's a short video.